When a 16-year old Andrew Ngu left tropical Borneo for Australia fifty years ago, he couldn’t speak English and didn’t know anyone in Melbourne, but had something many successful people carry – a strong desire to study, medicine in particular, and the determination to succeed. “I had a terrible first year in Australia. My father sent me here to study, I had never been away from home before. I was so homesick, I didn’t know the language and the weather was different – I felt so lonely,” he recalled. Facing tough competition in Australia, he knew he would have to be the best in order to get into medicine. “I had to do very well to get into medicine, because there were so many students who wanted to study medicine, but there were only eight spots in Victoria at that time. I had to be a top student,” Dr Ngu added. During his studies, he maintained good marks and got accepted to participate in training at the Royal Women’s Hospital. He then met Dr Hugh Robinson from Glasgow, the city where the ultrasound was invented. Dr Robinson was the first person to be trained by Dr Ian Donald, the man who invented the ultrasound. “At the time, I didn’t know what an ultrasound was. In my training to become an obstetrician, I used to spend every Wednesday with him learning about it. I also went to London to learn more about ultrasound, and became the second person to be trained in obstetrics ultrasound in Australia,” Dr Ngu said. That was the break-through point for his career, and steered his professional life on the road to success. In 1986, Dr Andrew Ngu started at PANCH health service as a consultant and moved with the hospital when it was relocated to Epping in 1998. He has been with Northern Health ever since. When he compares the hospital back then to now, he says one of the major changes is the expansion of the number of patients and services provided, along with the growth of infrastructure and administration. He also noticed the increase of staff, as the hospital grew from a family-type hospital to a big organisation. Dr Ngu now works at Northern Health one day a week, as he also runs a very busy private practice in East Melbourne. Besides his work at Northern Health, he was previously a consultant in the ultrasound department at the Royal Women’s Hospital from 1983 to 2012, and worked as a Senior Lecturer at Melbourne University until 1996. His collaboration on Rebecca Judd’s ‘The Baby Bible’ book has made him known to a wider audience. 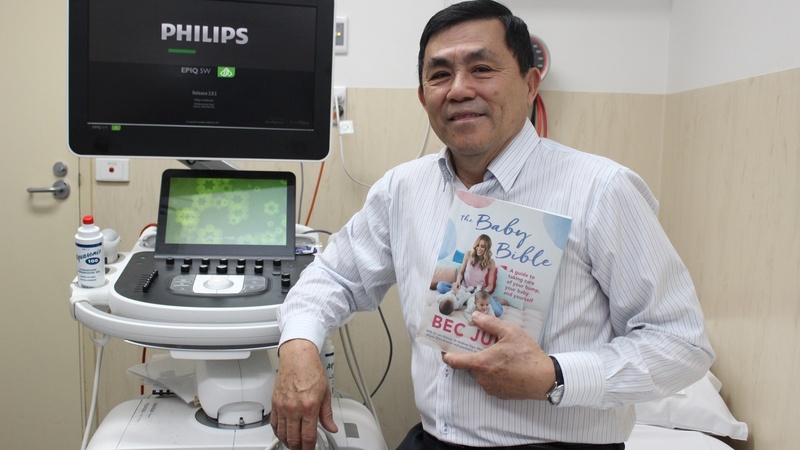 He looked after all of Rebecca’s pregnancies, and during her last pregnancy, while she was expecting twins, she suggested writing a book together, emphasising how an ultrasound can help with a safe delivery. “After brainstorming, we decided on writing a book that was structured into the three trimesters of pregnancy. Through the chapters, we follow all three and explain how ultrasound can assist in each of these stages, and address common problems and questions,” he said. To illustrate the importance of ultrasound, Dr Ngu explained that in the first trimester, doctors can rule out down syndrome, check and measure the structure anomalies and so many other risks. In the second trimester, they look at the structure of the baby in more detail and the cervical length, to see if the chance of delivering the baby prematurely is high or low. In the third trimester, they can check the growth and the well-being of the baby. Dr Ngu added that he advises women to have a baby earlier in life, rather than later, and to live a healthy lifestyle before falling pregnant and take vitamins like folic acid six months before falling pregnant. The book has had an influence on Dr Ngu’s popularity, and he sees the good and the bad side of people recognising him now, saying he is quite a shy person and not used to so much attention. He also made an appearance on Channel 7’s “Yummy Mummies” show, which has also raised his public profile. “Some people ring my practice and say they want to see the famous Dr Ngu who wrote the book. Others come up to me and congratulate me on the book. Whether I see it as good or bad, I’ve become a known individual in the world of ultrasound,” he added. Dr Ngu is married and has four successful sons, and four grandchildren, who live all over the world – in Paris, London and Melbourne. “To succeed in life, you have to have the desire to succeed. That is the first thing. Second, you need the opportunity. When you get the opportunity, don’t let it get past you,” he added. Dr Ngu said he never imagined his life would be like this. To give back to his home country, Malaysia, he started an ultrasound school in 2003, where he examines and teaches future practitioners.